Mozilla released its new Firefox 4 exactly a month ago today and within a day it had more than twice as many downloads as Internet Explorer 9 after its launch. Some where around midnight tonight the browser build will hit 100 million downloads after one month in existence, according to the Firefox download stats ticker. 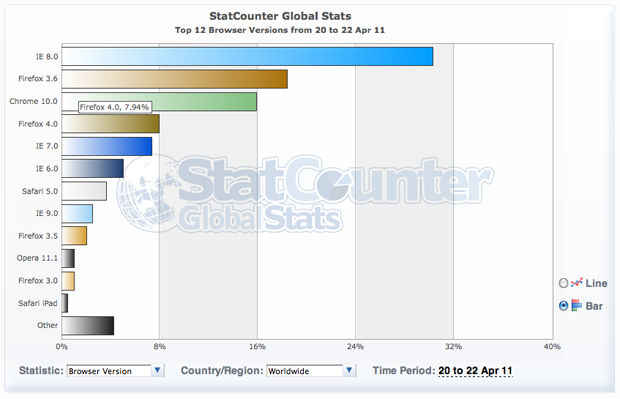 What’s more impressive is that the browser has now taken over 7.94% of the worldwide browser market according to StatCounter, with Internet Explorer 8.0 at 29.99%, Firefox 3.6 at 24.43% and Chrome 10 at 15.35%. When compared to the percentages two days after its launch it looks like Firefox 4 has taken a solid chunk out of Firefox 3.6 usage: On March 22 IE had 45% of the global market, followed by Firefox 3.6 with 30% and Chrome with 17%. Firefox 4 was at 1.95% then. Like Erick I too had stopped using Firefox because it was so excruciatingly slow, and was pleasantly surprised at how much faster 4 was compared to 3.6 and even compared to Chrome when loading Flash-heavy sites. But maybe being speedier isn’t enough to win the high stakes browser wars? On the Firefox 4 launch day, Chrome came out with its Chrome 11 beta, including support for an HTML5 speech input API (which essentially means that you’ll be able to talk to your computer).